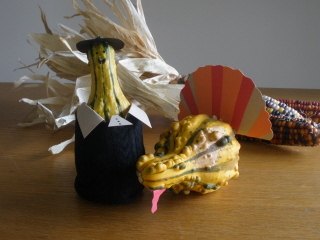 Thanksgiving is quickly approaching and I thought this would be an incredibly appropriate time to make gourd figures. I mean, when else would pilgrim gourds be more timely?! Food can be fun, delicious, and historically accurate. In honor of the first Thanksgiving please visit history.com to discover what might have been on the menu, and what wasn't. Personally, I was SHOCKED that there wasn't green been casserole. Who knew? So, next week I will begin a series counting down to Thanksgiving preparing what the settlers would have eaten. Starting with...sautéed eel.